A Spoonful of Sarah: The Big O-N-E! I'm sorry I haven't posted in forever but I've been busy at work and chasing around a BIG/little boy while planning his First Birthday Party. For his actual Birthday on Tuesday, Spiderman and I took him to Schoops for dinner. He had chicken strips, fries, some of my burger, and his favorite....chocolate milkshake! He had an awesome time, loved everything he ate and flirted with the waitresses. On Saturday we had a party at the house. Here's a pic of the birthday boy. We opted for cupcakes instead of a whole cake. I thought it was a better idea since we had several kids at the party and this way everyone had their own "cake". Jackson liked the singing but I don't think he was sure what was going on. 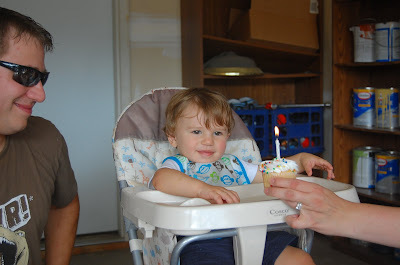 We put his high chair in the garage where we had set up tables. This made for easier clean up. 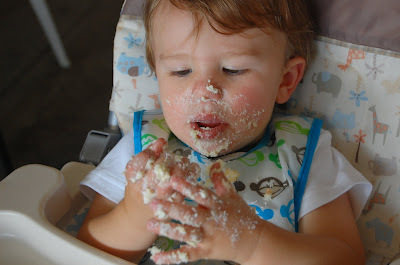 This was his first taste of cake but not his first of frosting. I have given him little tastes in the past. I can't help it, I have a sweet tooth too! Such a messy boy! He even had cake up his nose! My aunt snuck him a second cupcake and he was up and wired until after 9pm from that. When he was done with his cake Spiderman rinsed him off with the hose. He loved that part almost even more than the cake. 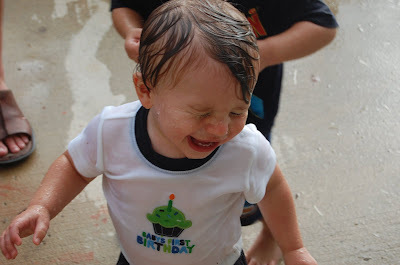 It was entertaining for at least 25 minutes as he ran through the spray of water giggling and squealing. He was also VERY into opening his presents. Once he caught on he ripped each one open with the glee that only a child can have. Spiderman was very good at moving the opened present out of the way while I got him ready for the next one. The gift opening went smoothly without a single fit over wanting to play with his toy instead of continuing on. Wow! Happy Birthday to your sweet babe and congrats!!! Not sure what to say first. 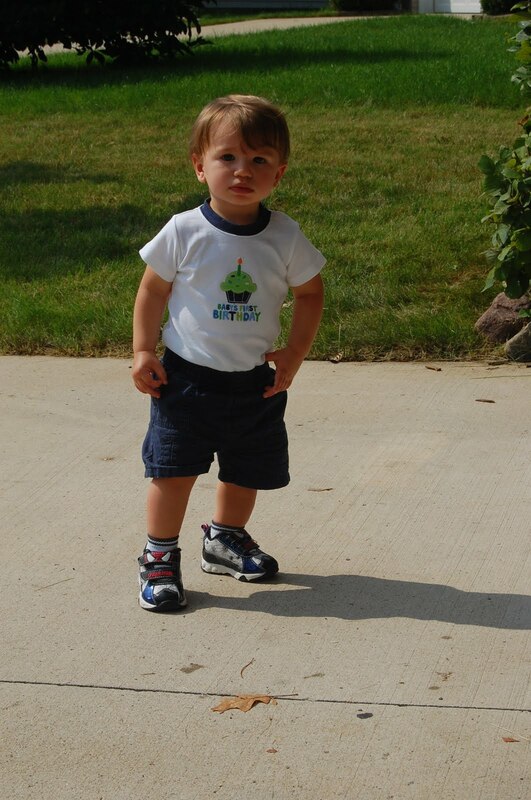 I cant believe that precious boy is a year old, and that he's going to be a big brother as well! Congrats!